The reasons for moving to Tampa Florida are numerous and diverse: there’s the relatively reasonable cost of living; the abundance of sunshine and warm weather (even in February); the proximity to beaches and water; professional teams to cheer on in all the major sports; a host of museums, theater, fine dining and other cultural attractions – the list goes on. 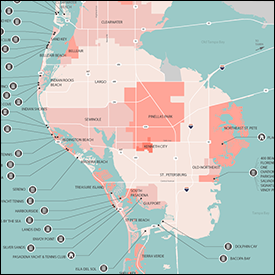 Whatever your motivation for landing in the Tampa Bay area happens to be, your family’s lifestyle will likely determine where in this expansive area you choose to live. Let’s take a look at where we are, and you can start thinking about where you belong. When we say “Tampa” or “Tampa Bay,” we are talking about an area that is much larger and more inclusive than the actual city of Tampa. Steeped in British and Spanish history, the area was inhabited by tribes of Native Americans, most notably the Seminoles, when European explorers such as De Soto and Ponce de Leon began to arrive and settle. While most of the development occurred on the eastern Florida shores, smaller communities of native Americans and Cuban fishermen made the Tampa area their home. In 1845, Florida became part of the United States and the Tampa Bay area got a bit more attention, particularly from the military and the railroads. The modern Tampa Bay is essentially divided into two large counties. Hillsborough County is home to the city of Tampa and all its suburbs, as well as smaller cities like Brandon and Plant City. Hillsborough communities stretch from the north, where you find New Tampa and the campus of the University of South Florida, to the southern end of the county, which includes Ruskin, Apollo Beach and Sun City Center. You can find Ybor City and its converted cigar factories near downtown, and in south Tampa there is MacDill Air Force Base. Hillsborough County encompasses over 1,200 square miles. and the 2010 census put the population at around 1.2 million people. In Hillsborough County you can get everything from downtown living in a luxury loft that overlooks the bay, to a gated suburban community with manicured lawns and award winning schools. You can also embrace your quirky side if you have one. Gibsonton, near Brandon and Riverview on the western side of the county, is a popular area for carnival enthusiasts. Lobster Boy and Percilla the Monkey used to live there, and even though you can’t keep circus tents on your lawn anymore, you were once able to keep elephants and no one batted an eye. On the other side of the bay is Pinellas County, home to St. Petersburg, Clearwater, and a cluster of calm and picturesque beach towns on the gorgeous shores of the Gulf of Mexico. Pinellas County separated amicably from Hillsborough in 1912. The county is a bit smaller, weighing in at 608 square miles and boasting a population of just over 900,000. Don’t let those stats fool you; it’s actually the most densely populated county in the state of Florida. It has the same urban and suburban options as Hillsborough. Young professionals, investors and snowbirds have been snatching up condos, townhomes and renovated bungalows in the city of St. Pete, as well as cottages and condos at the beach. You can find serene waterfront living up north in Safety Harbor, or Palm Harbor or Tarpon Springs. If you like a mix of beach activity and city life you might do well in Clearwater or Clearwater Beach. Another fun fact: Pinellas County has 35 miles of white sand beaches and 588 miles of coastline. So, what’s it going to be: a beachfront condo on the barrier islands, a single family home with golf course views, or a historic bungalow in an old Tampa neighborhood like Ybor City or Hyde Park? It all depends on how you like to live. Do you want new construction or homes with history? If you want to walk into a recently developed home and smell the barely-dry paint, you might want to think about a suburban community like New Tampa or Westchase on the Hillsborough side of the bay. You won’t have a lot of history or culture close by, but you will have enviable Super Targets, great restaurants, new schools and lots of family-friendly local fun. For more history and less brand-spanking newness, check out the St. Pete neighborhoods like Old Northeast, or explore established communities like Oldsmar. Or, get in touch with your inner pirate on a mature and affluent Tampa street like Bayshore Boulevard, where the Gasparilla parades gather every year. What do you do for fun? If you love baseball, consider St Petersburg or Dunedin and you can be close to the Tampa Bay Rays and Dunedin Blue Jays. Dunedin also has the enviable advantage of being close to Honeymoon Island State Park. The Yankees train over in Tampa, and if you want to live in Derek Jeter’s neighborhood check out swanky Davis Islands, an upscale community with stunning city and water views. Perhaps you plan to spend all your free time at the beach or on a boat. In that case, think about a spot that gives you what you want without a lot of tourists. The Redington Beaches are gorgeous and not a typical spring break destination. Treasure Island, Madeira Beach and Indian Rocks Beach are all cozy communities with little traffic and lots of bliss. Clearwater Beach and St. Pete Beach have a lot of hotels and tourists, but also loads of homes and condos and things to do. Are you a city person? If you need the constant buzz of drama and dazzle, there are properties in downtown Tampa and St. Pete that might appeal to your cosmopolitan sensibilities, where you’ll be close to museums, restaurants and theaters. South Tampa offers a trendy community of great restaurants, nightlife and fine homes. In the Westshore area near Tampa you’ll be close to downtown and within striking distance of International Plaza and all its glamour. Downtown St. Pete has been transformed in the past decade, with Beach Drive rivaling posh streets in Miami and L.A. We are lucky enough to have our entire downtown waterfront devoted to parks, marinas and recreational areas however. If the city is a great place to visit but not a place you’d ever live, look at communities like Seminole in Pinellas County or Citrus Park in Hillsborough, where you’re close enough to everything but can still count on a quiet evening at home, without an urban hum outside your door. What about quality of life? Traffic is a problem in all metropolitan areas, and if you moved from a congested city for a more relaxed lifestyle, you’re not going to be happy about sitting on 275 during rush hour. If you are a commuter, you’ll need to consider that in general, Hillsborough County has a lot more traffic than Pinellas County. And while the area’s network of bridges and highways might indicate that a spot with several onramps might be the best place for commuters to live, think twice. The Pinellas County barrier islands might seem more remote, for example, but the lack of traffic coming and going can make your trip to St. Pete or Tampa easier and quicker than trying to commute from a seemingly closer community, such as Dunedin in Pinellas or Westchase in Hillsborough. Your Tampa area relocation will bring you loads of sunshine, shorts in January, an affordable cost of living, and all the recreation you can accommodate, from sporting events to boat parades and art shows. Location is essential in this area, and maps can be confusing. Take some time to get to know the neighborhoods, and get some help from your real estate experts in Hillsborough and Pinellas Counties. What's Happening with the St. Petersburg Pier?